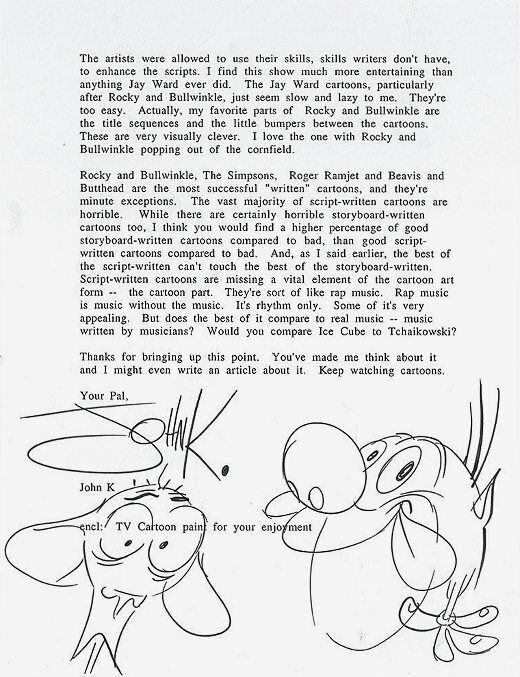 To begin 2011, below is a letter from Ren & Stimpy creator John Kricfalusi (on letterhead of his now-defunct production company, Spümcø) to a fan, in which he discusses Rocky and Bullwinkle; reveals his love for Roger Ramjet; debates storyboard-written vs script-written cartoons; and then compares the latter to rap music. Transcript follows. Image courtesy of S. Bairn. When I was a kid, I really liked Rocky and Bullwinkle. I loved the way the characters looked, and I still like their voices. Today, I find the cartoons pretty boring, mainly because of the writing. 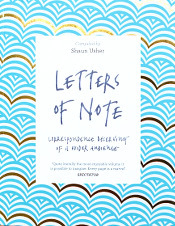 The writing style is somewhat based on radio comedy from the '40s and '50s. As radio comedy, the Jay Ward cartoons aren't as funny as the best of their inspirations. As animation comedy, it's not as good as the best of cartoons. Interestingly, there have been far more cartoons written in script form, and we still have yet to come even close to Bugs Bunny or Snow White. By the way, Bill Scott, who was the head writer of the Jay Ward cartoons, was a cartoonist. He learned his craft of cartoon writing by doing storyboards for UPA, Warner Brothers, and possibly other studios. Alex Anderson, who created Rocky and Bullwinkle, was an animator. The funniest "written" cartoon I've ever seen is Roger Ramjet. 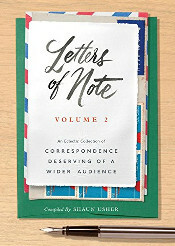 Its scripts were written and performed by radio people, then the soundtracks were handed over to Fred Crippen and Bob Kurtz, two very funny animators who took the scripts and made the material even funnier by drawing hilarious-looking characters and using a very clever cutting style to draw attention to the jokes and ironies. The artists were allowed to use their skills, skills writers don't have, to enhance the scripts. I find this show much more entertaining than anything Jay Ward ever did. The Jay Ward cartoons, particularly after Rocky and Bullwinkle, just seem slow and lazy to me. They're too easy. Actually, my favorite parts of Rocky and Bullwinkle are the title sequences and the little bumpers between the cartoons. These are visually very clever. I love the one with Rocky and Bullwinkle popping out of the cornfield. 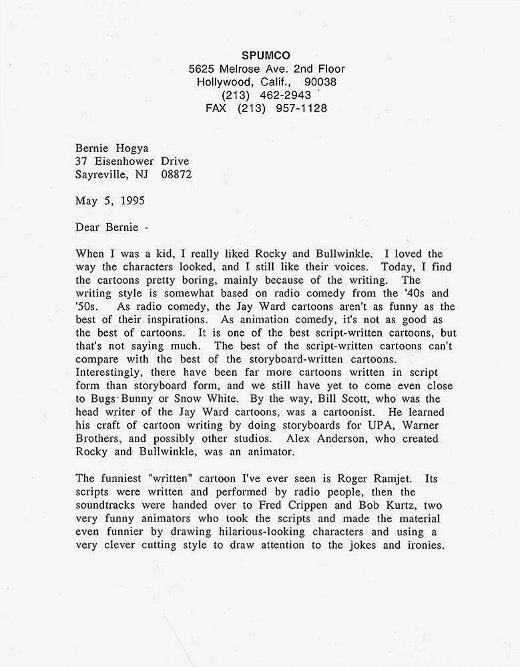 Rocky and Bullwinkle, The Simpsons, Roger Ramjet and Beavis and Butthead are the most successful "written" cartoons, and they're minute exceptions. The vast majority of script-written cartoons are horrible. While there are certainly horrible storyboard-written cartoons too, I think you would find a higher percentage of good storyboard-written cartoons compared to bad, than good script-written cartoons compared to bad. And, as I said earlier, the best of the script-written can't touch the best of the storyboard-written. Script-written cartoons are missing a vital element of the cartoon art form -- the cartoon part. They're sort of like rap music. Rap music is music without the music. It's rhythm only. Some of it's very appealing. But does the best of it compare to real music -- music written by musicians? Would you compare Ice Cube to Tchaikowski? Thanks for bringing up this point. You've made me think about it and I might even write an article about it. Keep watching cartoons.